Okay, I admit it, I’m kind of in a Tarot phase. Guess it’s a way to channel my creativity and find subjects for the “as a” challenge. I’ve always had a fascination for the Tarot. Not as something to tell the future, but as an instrument to tell of the present; to clear up one’s ideas. A bit like Rorschach inkblot test: it’s how you react to the cards that tell you what you need to know. The tradictional images have been worked and reworked throughout the centuries and are very good at eliciting reactions, helping the reader. Come to think of it, that could be something to try: a self-Tarot challenge. Every week, we post our personal take on one of the major arcana of the classical Tarot (doesn’t have to be self portraits). Anyone interested? Great shot! I love the effects on the trees. Oh my! This is spectacular. 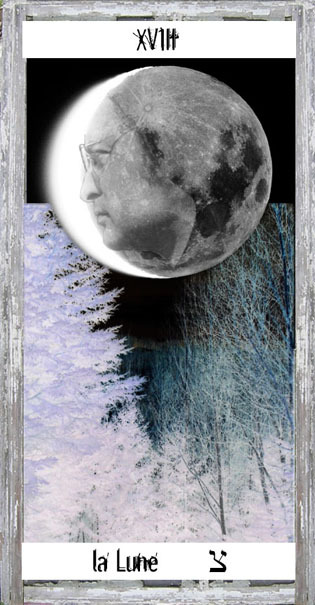 You make a lovely, mysterious Moon card (typically one of my favorite cards in the Tarot deck artistically, BTW). Wonderful effect and what a great choice by picking the moon. It is such a powerful and mysterious object.